Soon to be released in June 2017. A look from remote viewers inside the infamous AREA 51, recorded with LIVE remote viewing, all done blind. Area 51 in Nevada has long been one of the greatest enigmas on Planet Earth. No other governmental facility has had such a high level of secrecy associated with it. President Obama was the first American president to publicly admit that Area 51 even exists. Before that, it was just a spot on the map, a feature in movies, such as “Independence Day,” a secret military site that ordinary people could not visit and official people could not talk about. But with President Obama’s admission on Sunday, 8 December 2013, that Area 51 exists (see also the CIA acknowledgement) it now becomes a valid target for remote viewing. There are lots of verifiable elements on the surface that can be corroborated with remote viewing done totally blind. The only question remaining is what exists BELOW the surface. That is the million dollar question, and that is what the secrecy is all about. Now, for the first time ever, the secrecy of what is below Area 51 ends. Farsight sent some of the best and most highly trained remote viewers anywhere to take a look, and all under totally blind conditions. The viewers knew only that “there is a target,” nothing more. The viewers did not communicate with one another during the data-collection period. They recorded their data live on video, all solo. And when everything was said and done, the secret of Area 51 was no longer a secret. The only real “problem” now is that what really is below the surface of Area 51 is stranger than anyone could have possibly imagined. The Area 51 reality extends far beyond the fictional plot of any Hollywood movie. Now we know why all the secrecy has existed regarding that facility. Now we know why “THEY” were afraid to let the public know what “THEY” knew. PreviousPrevious post:Remote Viewing the Tunguska event of 1908NextNext post:8 Martinis Remote Viewing magazine – Issue 15 April 2017. 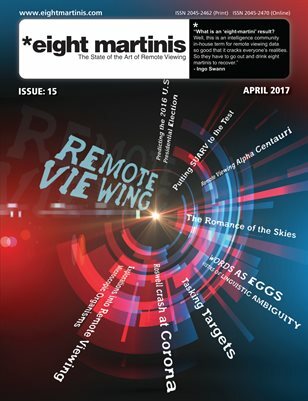 8 Martinis Remote Viewing magazine – Issue 15 April 2017.